This year Valentines Day falls on a Sunday and the day for our Bread for the Journey. I wanted to share truth from God's Word to spur us on to consider again what it means to love as followers of Jesus. The greatest act of love that the Father gave to us was sending His son to earth to live among us and to ultimately forfeit his life on the cross to save us. When we receive this great gift we can love as God loves. Happy Valentines Day dear readers! May the love of God fill your heart today and overflow to others! Do not hold back...tell those who are special to you how important they are in your life and what a precious gift from God they are. My father's funeral was on Valentine's Day. It's a poignant memory. 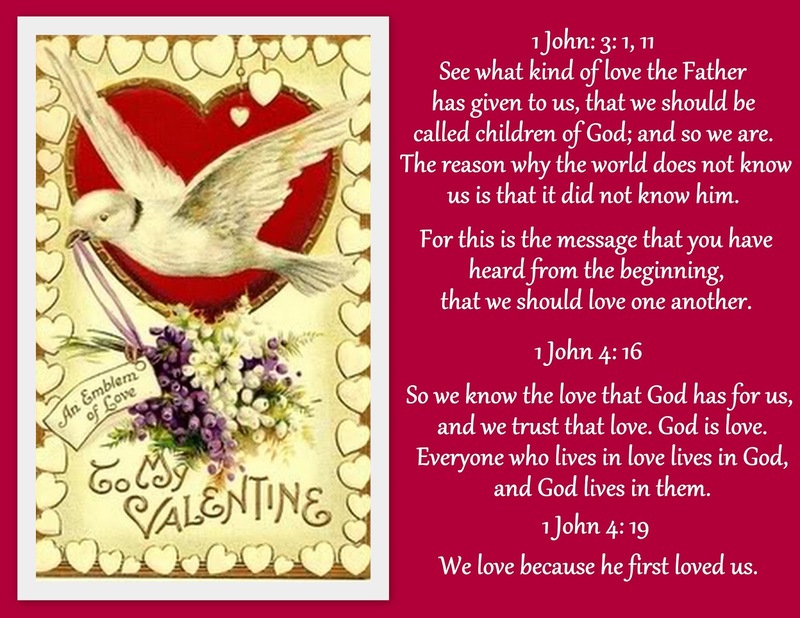 Beautiful Valentine cards Ellen with such wonderful verses reminding us of true love. Beautiful Ellen - hope you had a wonderful Valentine's Day!